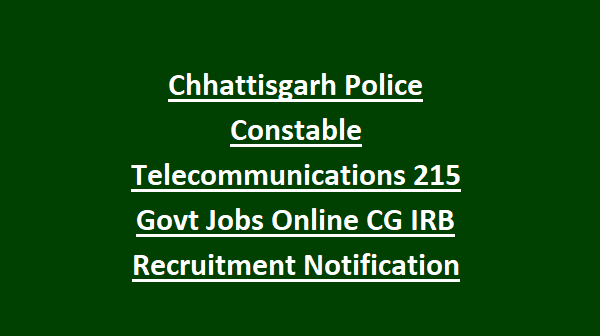 Intermediate or 10+2 with Maths, Physics & Chemistry they are only eligible for applying this CG Police Constable Telecommunications recruitment exam 2018. 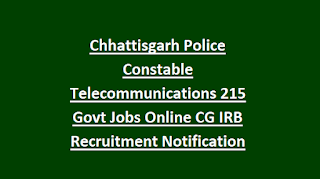 There are total 215 Constable Telecom jobs in these India Reserve Battalion jobs of CG Police. Candidates selection will be based on Physical Standards Tests PST, Physical Endurance (Running) Tests and written exam. Candidates must have qualified the physical tests to attend the written exam of CG Police Constable Telecommunications vacancy. Online applications only accepted for this IRB Police CG Constable Telecommunications jobs through www.cgpolice.gov.in. Last date to apply online for these IRB CG Police Telecom Constable jobs is 14-06-2018. Physical Test information (Height, Chest PST/PET), written exam pattern and syllabus, age limits and other details are given below. There are total 215 posts in this CG India Reserve Battalion Constable jobs recruitment 2018. Age limits as on 01-01-2018 is 18-28 years for general candidates. For SC/ST/OBC candidate upper age limit is 33 years. For all female candidates upper age limit is 38 years. For Constable Telecommunications candidates must have qualified Inter or 12th class with Maths, Chemistry and Physics Subjects. Candidates selection will be based on Physical Standards Tests in first stage, Physical Endurance tests PET in Second stage, written exam in final stage. Height for male candidates of Gen, OBC, SC is 168 cms. For male ST candidates of CG tribal height is 158 cms. For Naxal affected areas and hill areas candidates height is 153 cms. For all female candidate height is 153 cms. For male candidates running test will be conducted for 1500 meters which has to finish in 05 min 40 seconds. For Female candidates 800 meters running to be completed in 03 minute 20 seconds. For Telecom Constable a written exam will be conducted for 100 marks for physical test qualified candidates. Online applications only accepted for this CG Police IRB Constable Jobs. Last date to apply online through www.cgpolice.gov.in website is 14-06-2018.